This adaptable shelter system is providing temporary housing for refugees displaced by conflict in their home countries. 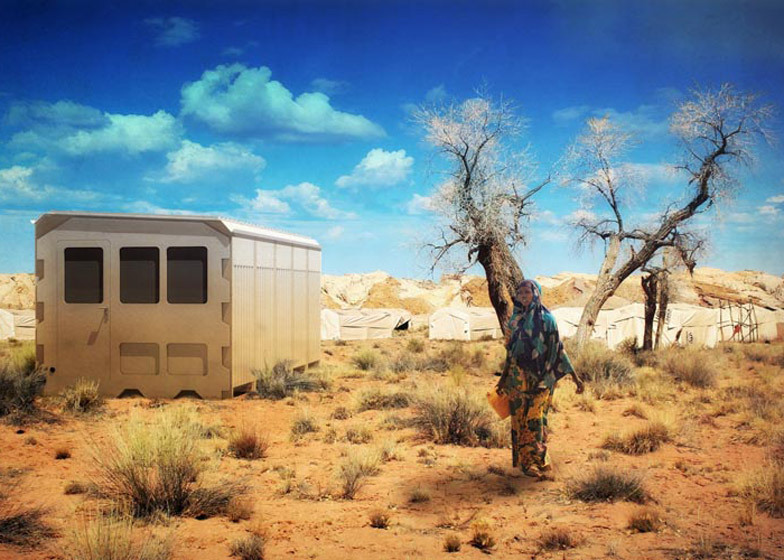 Designed by building initiative Suricatta Systems, the Shelter Unit for Rapid Installation (SURI) is both easy to transport and assemble, while still functioning as a comfortable habitat for individuals and families. Originally designed to provide shelter after earthquakes, the system is now being deployed to help house the millions of people fleeing conflicts in the Middle East and sub-Saharan Africa. A number of designers have been calling for practical and innovative solutions to help manage the refugee crisis in Europe. Vienna-based designer Talia Radford was among local residents offering aid in Austria and has asked creatives to mobilise in response to the situation. Richard van de Laken, founder of the What Design Can Do conference, also highlighted designers' responsibility to provide solutions for major humanitarian issues. SURI's modular design comprises sections that concertina open and attach together to create units of various sizes and functions. "The advantage of SURI is a that this is a modular system that can be assembled to create a variety of facilities from family dwellings to primary healthcare centres," said Pedro Sáez, director of Urbana de Exteriores, the parent company of Suricatta Systems. "It is also ideal for emergency field hospitals or mobile operating theatres in advance positions. As the system can be connected in multiple directions it allows for the creation of virtually any type of temporary building," he added. The housing system is composed of a lightweight framework surrounded by multiple layers of DuPont Tyvek – a UV-resistant breathable membrane used in construction. The exterior of each habitat contains voids that can be filled using readily available natural materials such as earth or sand, making the housing stable and providing additional insulation. A rooftop water collection system filters rain into drinkable water, adjustable apertures can be used to control interior light levels, and solar panels can power the habitat's domestic requirements. The walls of the structures are also treated to protect inhabitants against mosquitos. All materials used in the habitat are recyclable or biodegradable, and Suricatta Systems claims SURI has a 10-year life span. The project has been initiated by the department of innovation within Spanish construction company Urbana de Exteriores, with participation from the University of Alicante. After helping rebuild after disasters in Spain and Haiti, Urbana de Exteriores volunteer teams were spurred onto establishing Suricatta Systems to develop a fast and cost-effective emergency housing solution. "In Lorca we had the opportunity to check, in-situ, the harsh living conditions in which the victims found themselves, together with the difficult working conditions that the people helping them had to face," the company said in a statement. "The initial contact with specialised UN agencies and NGOs involved made us realise that this was an area for great development. These and other similar situations were being experienced every day in many parts of the world, and millions of people are still being affected," they added. A similar solution for temporary housing has been created by Ikea, which is producing 10,000 of its flat-pack shelters designed for refugees made homeless by conflict and natural disasters. The project was praised by design critic Alice Rawsthorn as "one of the most important design developments of the past decade". Earlier this year, Dezeen spoke to Architecture for Humanity founder Cameron Sinclair about his current projects, which include the housing of refugees from Syria. Photos courtesy of Urbana de Exteriores.